Our regular sized solid red candle has many uses, such as for holidays, weddings, dinners, special events, arts and crafts, or for decoration. Our solid color candles are unlabeled with the UPC code on the bottom. 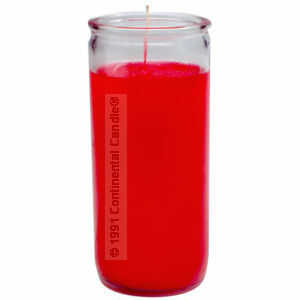 One of the Sanctuary Series® candles manufactured by Continental Candle Company. All Sanctuary Series® candles are manufactured in the U.S.A. using quality wax and 100% cotton wicks.